I stumbled across California when I saw this record was touting that it featured members of Green Day and Jawbreaker. That was enough to get me to take a look at it, though I certainly can't say I was surprised to find out it meant the old drummer from Jawbreaker, Adam Pfahler, and Jason White, best known as that other guitar player who isn't Billie Joe in Green Day and Pinhead Gunpowder. That last sentence may sound derisive, but even though these two may not have the name value of some of their bandmates, they are integral parts of some really tight, white hot bands, so my expectations were still pretty high. 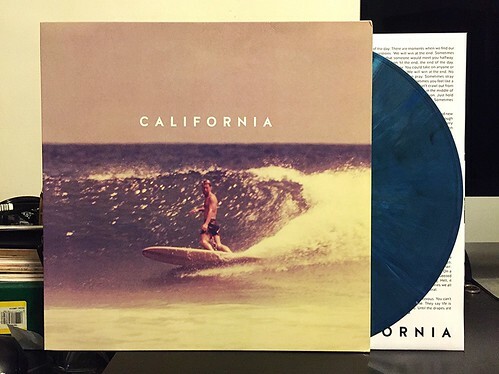 California is just a picture perfect example of a good record. That's what it is; it's good. It's not great, but there are some pretty good songs on it. There are some records that just blow you away with their greatness that make you just want to ball up your fists, scream into the air and tell everyone you know that they must own this record. I can't see California ever making anyone feel that kind of passion. But again, it's a completely solid album full of mid-tempo, reasonably catchy tunes that feature serviceable melodies and some pretty interesting guitar riffs. It's not aggressive enough to really be considered punk, but it is loud enough where I wouldn't dismiss it as pure indie. It kind of reminds me of old 90's bands like Ridel High or to a lesser extent, Ultimate Fakebook. Two other bands that just have a lot of good songs (with Ultimate Fakebook having a handful of truly great ones). I'm sure this review isn't really inspiring anyone to run out and grab this record, but at the end of the day I do think it is worth picking up. Not everything in this world is off the charts great. There's room for some records that are just a good pleasant listen, and California fits this bill to a T.